The world is faced with a new challenge, while Ukraine is defending itself in a war waged by the Kremlin, says Lithuania's first post-independence leader Vytautas Landsbergis. 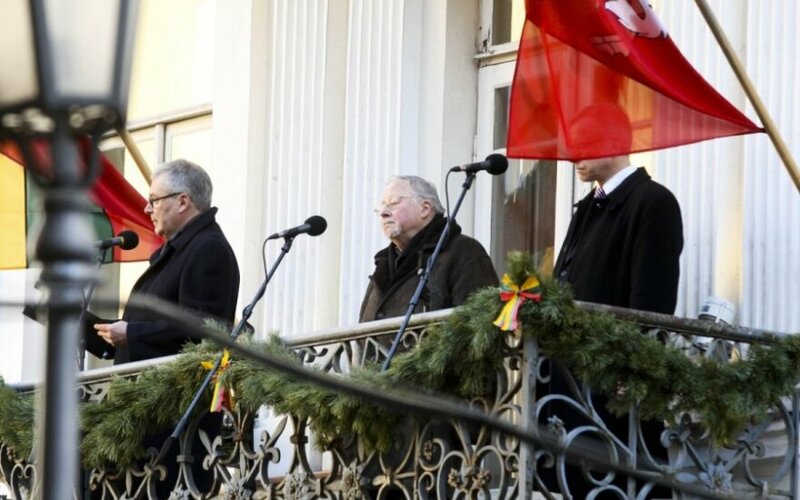 Speaking at an event to mark the Day of Restoration of State outside the House of Signatories in Vilnius on Monday, Landsbergis urged people to vote for pro-European politicians rather than supporters of Russia during the upcoming elections to local governments. "The time of fate has come – what will the world be in the future, if it wants to survive beyond Monday. It won't, if it continues living on hatred. It is either humaneness or inhumanness. Let's look around us and inside us because we are all participants of the new global challenge. Let Lithuania perform its duty once again," said Landsbergis. On Monday, Lithuania celebrated the Day of Restoration of State. On 16 February 1918, the Council of Lithuania proclaimed the restoration of the independent state of Lithuania, founded on democratic principles, with Vilnius as its capital.